The largest ships stop at Verdon and that's two hours from the city. Bassens which is half an hour, and the luckiest ships, the smaller ones, are the few that get to tie up in the city center (Port de la Lune). Bordeaux is situated 60 miles from the sea, and the transit into the city, at the head of the Gironde Estuary, is worthwhile to watch if you're an early riser. Your first sight upon entering the city will be the fine 18th-century architecture along the quayside where your ship will dock. Fairly large ships, up to 250 meters, can navigate the broad, muddy Gironde up to the center of Bordeaux. They dock near the Esplanade des Quinconces and Place de la Bourse, thus cruise passengers disembarking at Bordeaux have the added advantage of being able to reach the city center by foot, only a few minutes walk from all that this great city has to offer. This a tidal river, the gangways will be steep at times. Here, less than 250 yards from the quays, in the heart of the 18th century historical sector, they will find beautiful architecture, charming squares and parks, fascinating museums, intense cultured activity and bustling, great places of entertainment and fascinating architecture. Cruise calendar for this port, scroll down to see all ports. The new city is laid out with wide streets, spacious squares and many imposing buildings while the old quarter has narrow, crooked streets and numerous wooden structures. Places of interest include the Porte de Bourgogne, an 18th-century arched gate, St André cathedral (consecrated 1006), Sainte-Croix church, a 12th-century Romanesque basilica, the Hôtel de Ville, the 18th-century Grand Théâtre, and several art museums. The Golden Triangle The most interesting and beautiful historic neighborhood in the city is encompassed by three roads: Cours Clemenceau, Cours de l'Intendance and Les Allees de Tourny. This compact quarter is best enjoyed by wandering around on foot. Guided two-hour walking tours are available from the tourist office at 10:00 and 15:00, and are conducted in both French and English. The tourist office offers several wine tours, for example to the wine chateaux of the Medoc and St. Emilion. Visits and outings are offered by the Tourist Office and professionals of Bordeaux tourism. 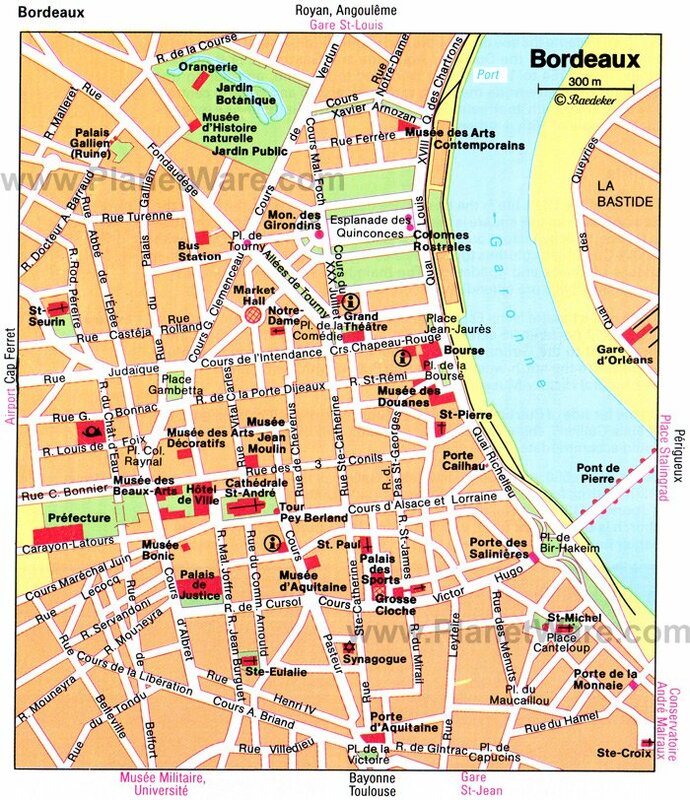 Despite Bordeaux being a fairly large city, almost all of the notable attractions are in the center, most of which is zoned as a pedestrian area. Bordeaux has a wonderful electric bus called la navette du center-ville. This is the only public transportation allowed on the pedestrian roads in the city center. There are no designated stops on this bus. When you want to get on board, just wave your hand to the driver and when you want to get off, ask him to stop. Taxis charge about 50 Euro per hour. To the Dune du Pyla: it is possible to cycle the 50 km from Bordeaux, through fragrant pine forests, to the last sand dune cycle in an hour and a half. Speaking of dunes, an excursion to the Dune du Pyla is an absolute must: imagine a giant sand dune 5 km long and 111 m high, standing between the forest and the ocean. The Bassin d'Arcachon is a paradise for oyster and seafood lovers. Cap Ferret is the trendy Bordeaux beach; this sandy point covered in pines is situated between the calm waters of the Arcachon Basin and the sometimes turbulent waters of the Atlantic. Incredible views are guaranteed. The Rue Sainte Catherine is a very long pedestrian shopping street, starting near the tourist office and The Grand Theatre. Bordeaux's cuisine has become well known to the world mainly due to the illustrious Bordeaux wines. Bordeaux's food is normally prepared in a straightforward manner, without any attempt to reach gastronomic heights. Bordeaux's terraces are open late into the night much to the enjoyment of night owls and the cities' students. The Place de la Victoire is where most of them can be found enjoying tapas, music and a wonderful energy that doesn't let up until very late, especially on weekends.